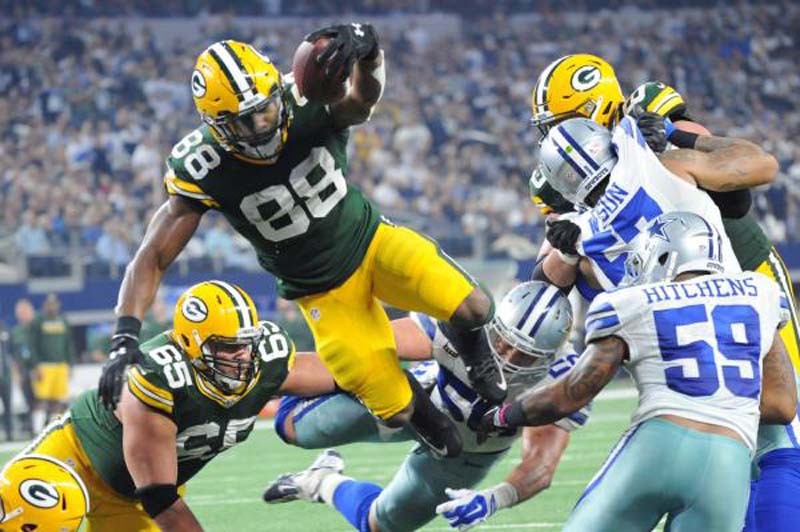 Green Bay Packers running back Ty Montomery endorsed the team's plan to use a "running-back-by-committee" scheme in their ground game this season. Packers head coach Mike McCarthy said earlier this year that the tailbacks will share the running-back chores and no single tailback will carry the load. That means Montgomery, Aaron Jones and Jamaal Williams will each get carries. "That's what you want," Montgomery said, via the team's website. "You want to know your teammates -- even though you're all fighting for a job -- you want to know no matter who's in the game, that guy is going to get the job done. "If Aaron's in the game or Jamaal's in the game or I'm in the game, we all bring something different, and everything that we bring has been effective. You want that. You want depth, you want versatility. I'm excited for what this room brings to the table." Montgomery missed eight games due to injuries last season, and finished with 271 rushing yards on 71 carries, an average of 3.8 yards per carry. Montgomery, who came into the NFL as a wide receiver, also had 23 receptions for 173 yards in 2017. Rookie running backs Jones and Williams got more playing time than expected last season. Jones, who played in 12 games, including four starts, had 448 yards on the ground and a 5.5 yards-per-carry average, while also catching nine passes for 22 yards. Williams played in 16 games and started seven of them. He recorded 556 rushing yards while averaging 3.6 yards per carry, and had 25 receptions for 262 receiving yards.